There are very few writers who can leave a mark from the early days of their careers. Gary McMahon not only is such a writer, but he also doesn’t waste any opportunity to prove his talent, with little consideration for the length of his fiction, but only for the quality of it. The latest work released by Gary McMahon is a novella published by DarkFuse Publications, “Nightsiders”. Gary McMahon has the ability to take some of the violent pieces of news we all see on the TV or newspaper and give them a new dimension. As is the case with “Nightsiders”, the story at the base of the novella can be easily encountered in the TV programs or morning papers almost on every day basis. Robert Mitchell and his family seek a refuge into the small town of Battle from their recent violent experience in London, but at the return from a planned vacation they find their newly bought home occupied by another family. But if these stories are often related in a cold and detached manner Gary McMahon goes deeper behind the scene, explores more profoundly the facts and details of this type of story. This would only seem that changes the way a piece of news is related, but the truth is far from it. Not only Gary McMahon goes deeper within the story, but he also connects the tale and reader tighter through a gripping plot and believable characters, invades the reader’s personal space in an intimate way and throws one with ease in the clutches of fear. There are a couple of supernatural elements that can be seen as an escape for the reader, but don’t rely on it for safety, the true terror lies in the human nature and its capacity for evil. The story of “Nightsiders” gravitates around two families, with an emphasis on the Mitchells. Irreversibly changed by violence they find no reprieve in the secluded and small town of Battle, on the contrary they’ll come face to face with another episode of viciousness. Among the four members of the Mitchells Robert sees himself as the head and protector of the family, but he struggles to find an escape from the new threat. With his world already in full collision with a world of violence Robert Mitchell is confused and insecure, he feels the unity of his family coming apart and the entire situation slipping from his grasp. If these are hardly qualities appropriate for raising a reliable defensive wall around of his family, Robert’s desperation and vulnerability lead him to a point of no return and that might come in handy in Robert’s attempt of reclaiming a feeling of security. All these elements of weakness make Robert Mitchell a character that draws plenty of sympathy from the reader, but with some traces of unpleasant personal history finding way through a breach in his present he might not be very likeable. But in the end, show me one person who is entitled to cast the first stone thanks to a spotless behavior and I will remove Robert Mitchell from the hall of clearly defined, strong and believable characters of fiction. In “Nightsiders”, as is the case with all Gary McMahon’s works, the author doesn’t put all his effort in building only part of his cast to perfection. The antagonists are not neglected, they do not put a show only for the sake of having a villain. In this instance, the Corbeaus are as lively as the Mitchells. Although they do not get the same space for development, that doesn’t make them less solid. They feel as real as the characters given a longer appearance, the Corbeaus are the persons who the readers, like the Mitchells, prefer never to intersect. And when the plot brings these two particles there is no guarantee for the outcome. Particularly when nothing is rushed in the plot, the reader is slowly but inevitably drawn within the story, the tension is flawlessly built and is extremely difficult to find a fault in the road taken by the tale from start to finish. There is one more path “Nightsiders” takes, that of the metafiction. After all, the character of Sergeant McMahon could be seen as a reflection of Gary McMahon in the story, keeping a closer eye on his characters and story. And when both are subtly herded towards their preordained road McMahon, the character or author, leaves them assured that they will follow their natural course. Another character, Robert Mitchell, when faced with what looks like a situation without an exit, starts to question existence and destiny. His reflections are often pointed toward the process of creating works of fiction, raising questions about fable and reality. Everything is masterfully done though, not single time these aspects hindering the progress and solidity of the story. With a final, well executed touch the metafictional elements leave some room for everyone to take a breath, without reaping anything from the inflicted fear and discomfort, only provoking the reader to profound considerations. Ever since his debut Gary McMahon made an impact on the horror genre and continues to do so. 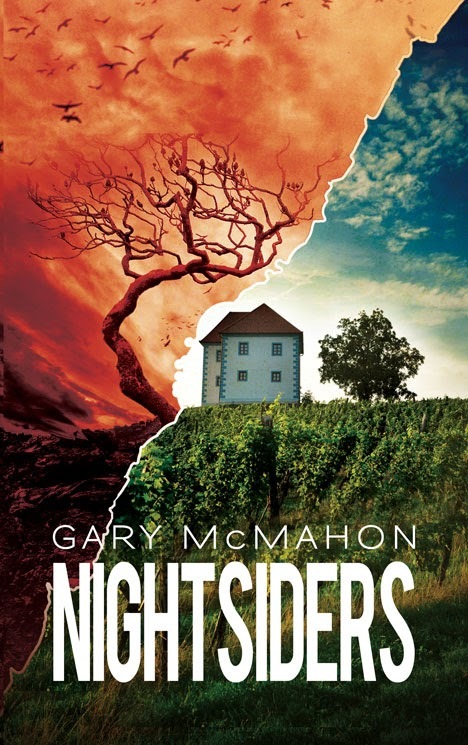 “Nightsiders” is just another proof of the quality and high-standard of Gary McMahon’s writing and one more brick paving his route in becoming a classic of the genre.